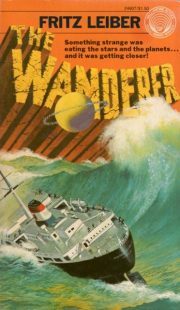 To steal a description I posted on actor Amal Al’s Facebook wall a few days ago, Fritz Leiber’s 1964 The Wanderer is about “hollow planets filled with catgirls who want to steal the moon.” Many of you may think that sounds awesome or at least intriguing. Certainly a sufficient number of fans  thought so; the novel won a Best Novel Hugo in 1965. The reality of the novel falls well short of its potential. Yesterday’s Tomorrow AD: the Americans have a moon base, and the Soviets have a manned Mars expedition. The Cold War simmers, threatening to go Hot. That would be the only threat to the planet as a whole … or so they thought. Four photographs of distorted star-fields foreshadow a grim reality. There are aliens and they are on their way to Earth. What do they have planned for us? 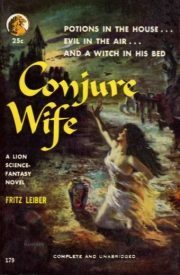 Fritz Leiber’s 1952 Conjure Wife, first published as part of the second and final Twayne Triplet Witches Three, has a rep as a classic horror novel. Now, if you look at the Wikipedia article on this book, you may notice that all the critics cited are men. There’s a reason for that … and it’s not just that the literati doing the reviewing when this book was first published were mostly men (as was the wont of the time). This is a book that a certain kind of man might like. Conjure Wife is a sterling example of a specific variety of mid-20th-century sexism. Despite some early missteps, fifteen years into his career Norman Saylor is doing fairly well. A professor of ethnology at small Hempnell College, he is popular with students and colleagues. He’s even rumoured to be in the running to be the next head of the sociology department. This is not a big deal in the broader academic scheme of things: Hempnell is a small town college that caters to parents who are afraid their children will be corrupted by big-city universities. It is a bastion of dowdy conservatism. However, Saylor is happy to be a big frog in a small puddle. Compared to his stodgy colleagues, he is young, cutting edge, modern. His life is perfect. Or so it seems until the night he rummages in his wife Tansy’s dresser drawer. 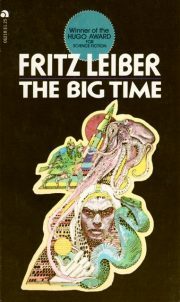 Fritz Leiber’s 1958 Hugo winner The Big Time fits a very large setting into a very small package. The context of the novel is the Change War, which is being fought to reshape history across the universe. Narrator Greta, doppelganger of a slain American woman, has a very minor role in the war; she is an entertainer in the Place, an R&R facility tucked away in a pocket universe. Unfortunately for Greta’s life of routine, the War is about to intrude into the Place.